Second part of Islington’s doorstopper epic fantasy trilogy (The Shadow of What Was Lost, 2016), set in a world of the Gifted, whose magic lies in being able to tap into their own life force, and the Augurs, who wield a higher-order magic. Islington supplies a "refresher" of the events of Book 1 that isn’t as helpful as you might suppose for reasons that will soon become clear. The laws that kept the Augurs and the Gifted constrained have been changed to allow them to defend Andarra against mysterious invaders. 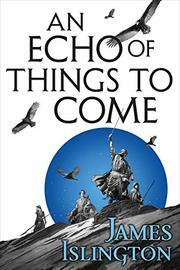 Three 16-year-olds who became friends at a school for the Gifted, Davian, Wirr, and Asha, now face different futures. Davian must learn to control his Augur powers and determine why the Boundary, put in place many years ago to keep out an invader called Aarkein Devaed, is weakening. Wirr, who, following his father’s death, is now Prince Torin the Northwarden, suspects that the story his father told him was false and must also deal with his interfering mother. By means of treachery, Asha’s Gifted powers have been suppressed, turning her into a Shadow; determined to find out how and why, she may discover more than she bargained for. Their friend Caeden has learned he’s an immortal; worse, he was once Aarkein Devaed but could not bear the crushing guilt and deleted his memories. Now he finds he needs them back; but is he really as evil as everybody says and he himself believes? With the narrative lacking the clear theme usually found in epic fantasy, the particulars assume critical importance; without them readers will be unable to decipher such magnificently gnomic passages as: "Andrael’s ridiculous weapon did its job and took my Reserve, so the Siphon is now bonded to Ashalia rather than me. If you want to seal the ilshara, she will need to find the final Tributary. The one that you set aside for Gassandrid, until he began to suspect and split himself." Though the book is vastly overelaborate, the steady pace and intricately fascinating details are relentlessly gripping; fans of the first volume won’t be disappointed.